I have a Christmas postcard to share with you today. The base is a That's Crafty White/Greyboard postcard available from Lisa B Designs. 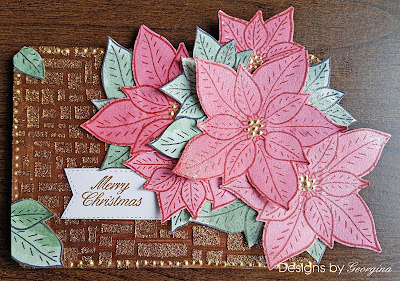 For the poinsettia flowers and leaves I used my Designs by Georgina Poinsettia Tag stamp. All available from Lisa B Designs. 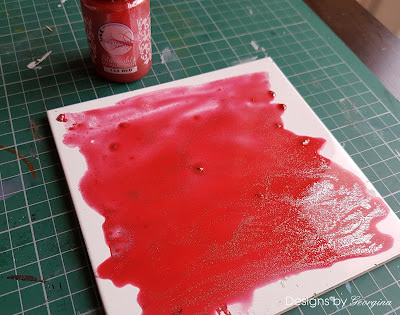 I used some Red Starlights I had left on a tile to create the red card for the Poinsettia flowers. 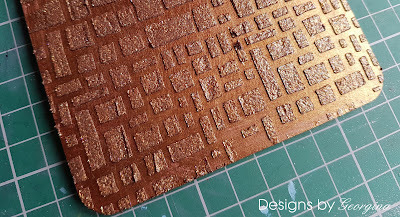 I added a lot of water to the Starlights and spread it all over the tile as shown below. I then placed watercolour card onto the tile and pleased down. The Starlight was then transferred to the card. 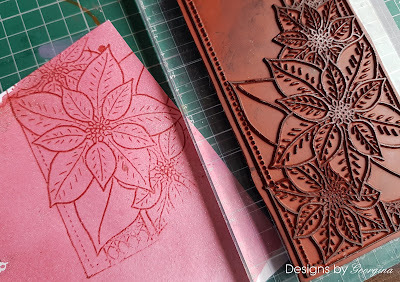 Once the red card was dry I stamped my Poinsettia Tag stamp onto the card with a red Archival ink pad. I stamped as many Poinsettia flowers as I could fit onto the red card. For the leaves I stamped the Tag with Fern Green Archival ink pad and painted in the whole images with watered-down Green Starlights. I cut out all the flowers. I added White Gold Starlight to the centre of the flowers with the end of a paint brush, as shown below. I painted the postcard with a Topaz Starlights. 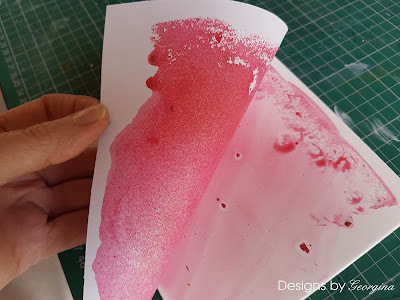 I wanted to add some dimension and texture to the postcard in a co-ordinating colour. So I adding the Topaz Starlights to Diamond Sparkle Medium so I create a paste that was suitable to use through a stencil. 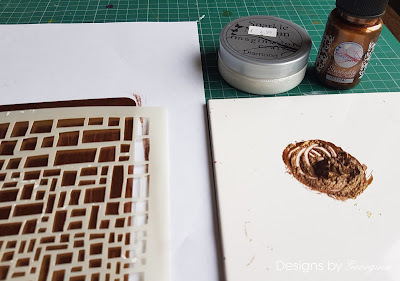 The stencils I used was my Designs by Georgina Blocks and Curves stencil. 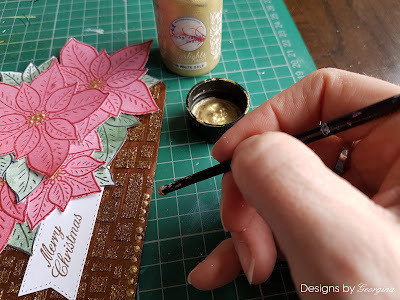 Once the stencilled background was dry I attached the flowers and leaves to the postcard. 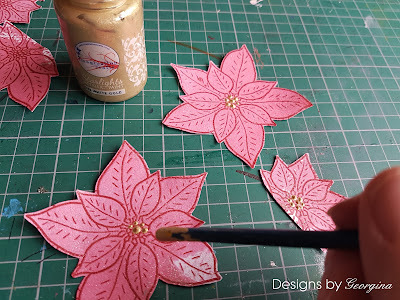 For the leaves I used the flowers which I had stamped and coloured in green. I stamped the sentiment onto white card and attached it to the postcard. 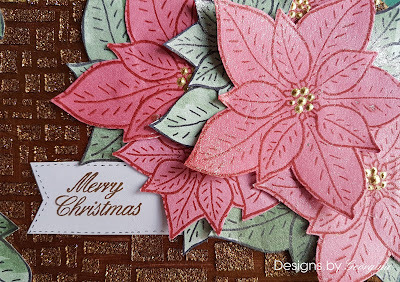 The sentiment is included with my Poinsettia Tag stamp. To finish the postcard I added dots of Gold Starlights around the edge of the postcard with the end of a paintbrush, as shown below. Thank you Georgina, this is beautiful! I love this. 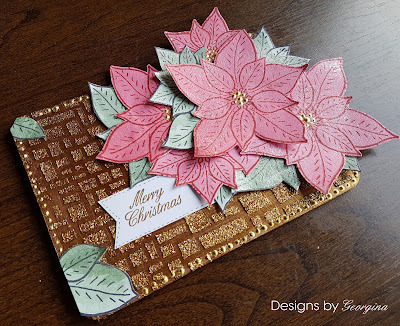 The poinsettia is beautiful & the background texture looks great.